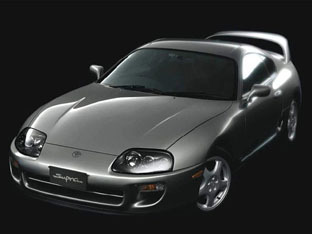 The first Toyota Supra's appeared in Japan in 1978, and production continued until 2002, with the car undergoing three major revisions culminating in the Mk IV twin turbo Toyota Supra of 1993 - 2002. The Mark IV Toyota Supra was offered with two different engine options; a naturally aspirated 2JZ-GE, 3.0 litre, straight 6 with 220 horsepower and 210 ft/lbs of torque, and a 2JZ-GTE 3.0 litre twin turbocharged straight 6 with 320 horsepower and 315 ft/lbs of torque. 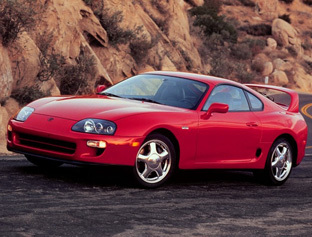 For many, part of the twin turbo Toyota Supra's attraction comes from the easily upgraded power output. 450 - 500 horsepower can be had out of the stock turbos with a free flowing intake and exhaust system coupled with an aftermarket boost controller. The MKIV Supra's turbochargers operate in a sequential format where, at first, all of the exhaust gasses are routed to the first turbine for reduced lag. This results in increased boost and enhanced torque as low as 1800 rpm. Approaching 4000 rpm, the exhaust gasses are routed to the second turbine for a "pre-boost" mode, although none of the compressor output is used by the engine at this point. Around 4500 rpm, the second turbo's output is added to the intake air, and both turbos operate in parallel. 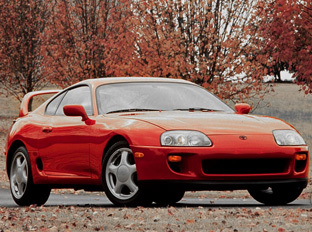 The sequential operation of the Toyota Supra's turbos allow for improved low-end response. 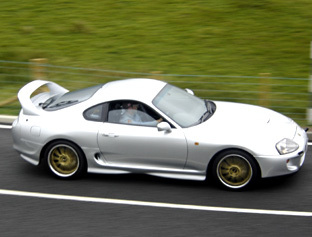 The Mark IV Toyota Supra, although no featherweight, was extensively lightened compared to the previous generation. The use of aluminium for the hood, targa top, front crossmember, oil pan, and upper A-arms helped. As did dished out head bolts, a magnesium steering wheel, plastic petrol cover, and a gas injected rear spoiler. 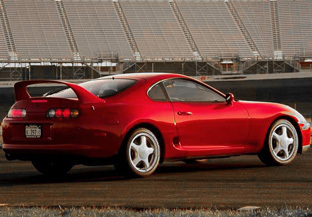 Despite having more features such as dual airbags, traction control, larger brakes, larger wheels, and larger tires, the MK IV Supra was at least 45 kgs (100 lbs) lighter than the outgoing model. 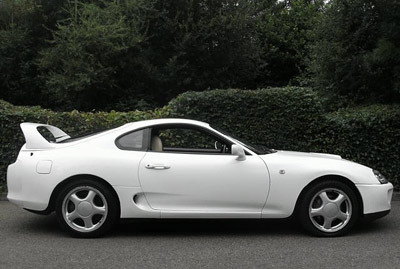 The MKiv Toyota Supra saw an extensive weight reduction diet over the previous version of this model. At a time when Supercars were being produced left right and centre, Toyota decided to get in on the act with the MKiv. 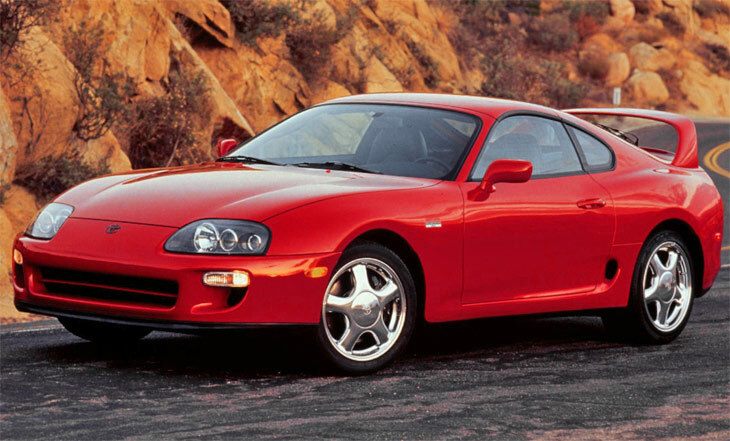 Honda had already realeased the NSX and Nissan with the Skyline and the 300ZX, and with Europe and its choices of British, Italian and German high performance cars the Supra was fitted with a twin turbo setup and the export version hit the market with 326bhp as standard. The export version of the Supra was the highest specification version of the Supra, this is strange as the Japanese home market versions are usually this way. So therefore this saw the export versions fitted with stronger steel turbos, bigger brakes, bigger fuel injectors, glass headlights, full leather interior, and generally more 'toys'. They were all twin turbos and came in either 6-speed manual or 4-speed automatic. The export MKiv was generally over engineered, it therefore produces a car that can easily be tuned to the 450-500bhp area without the need to upgrade vital internal parts. The getrag 6-speed gearbox is a good strong unit and the 6-cylinder engine is a racey unit with plenty of torque. 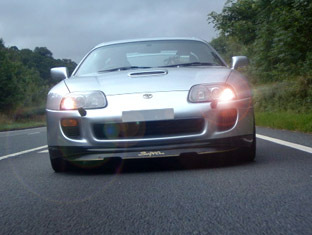 The export Supras were tested and produced a 4.9sec time to get to 60mph. The top speed of the export versions is 180mph, and 6th gear if it were allowed would result in a top speed of 196mph if the car had the power to get there. 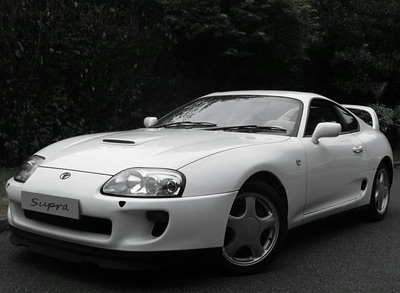 The Japanese home market versions of the Supra came with a large tick-box on the specification lists. But the two main models were the RZ (the twin turbo) or the SZ (the normal aspirated version). Later in the production line the GZ was released which was basically an RZ with all the extras ticked. And later still the Japanese home market version went through a facelift giving it the bigger brakes and other details which included a modification to the front bumper. The engines between the J-spec and the export version has some considerably differences. The turbos were ceramic as opposed to steel, the fuel injectors were smaller and although the torque figure was still very coparable to the export version the bhp figure was slightly down. The J-specs had a top speed of 170mph due to the slightly lower bhp figure. And, they got to 60mph in 5.1sec. The automatic versions always had slightly worse performance figures due to the power loss through the transmission, but the auto box is still considered one of the best on the market. The Euro-spec version of the export model saw the inclusion of a bonnet vent to aid cooling to cylinders 3 and 6, the Japanese home market and US export version never had a bonnet vent. 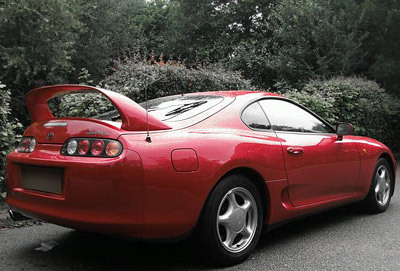 Some home market Supras appeared with no rear spoiler, this is down to the tick-boxes on the spec. list.